Lego train sets are excellent for kids to build and play with as they keep them engaged in activity for hours. Building these sets is excellent for your little one’s motor skills and hand-eye coordination. The more challenging Lego sets are best for older kids whereas the ones that come with bigger and less pieces are great for toddlers. No matter how old your child is, you can be sure that the sets mentioned in our review will inspire them to be more creative. If you have been struggling to decide on a Lego toy train for your kids, you can be sure to find what you’ve been looking for here! A buyers guide section is also available at the end that provides you with additional information that could prove useful. With a total of 1,226 pieces available, you can be sure that your little one is provided with plenty of parts to spend a while putting together. Assembling this set is great for your child’s motor skills and hand-eye coordination. It comes with a control center, 4 cars, forklift, and an armored vehicle. This ensures that kids have plenty to play with after they have finished building the set. A number of mini figures are also included which means you can expect them to play with a lot of imagination. We were also impressed with how this set can be used along with other Lego sets too. This enables children to build with more imagination and really put their creative thinking skills to the test. 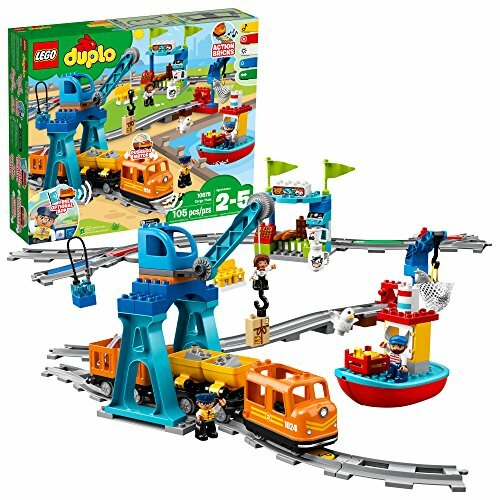 This is a super fun set that challenges children to construct their set with the huge array of pieces available. Their motor skills, coordination, and creative thinking are able to benefit. 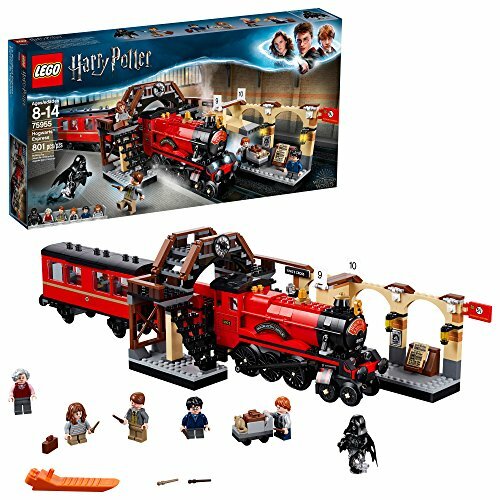 If your kids are fans of the Harry Potter books and movies, you can feel confident in knowing that they will absolutely love this Hogwarts Express train set. It features a range of 801 pieces. Therefore, your little one is able to spend quite a while assembling this set. Following the instructions and putting the pieces together requires a lot of focus and can improve your child’s problem-solving abilities. Moreover, building the train is fantastic for your child’s motor skills and hand-eye coordination. We also liked how it features mini figures for children to play with creatively for hours. Kids who love Harry Potter have been having a ton of fun building this kit and play imaginatively with it afterward. 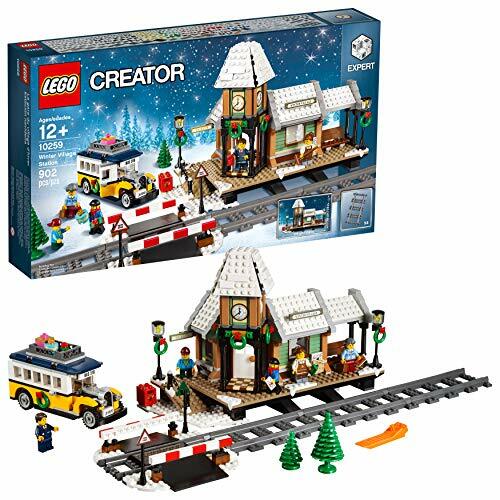 Kids have been having a lot of fun with this Winter Holiday set as it comes with a range of 734 pieces available for children to stay occupied with building for a long time. You can be sure that it will challenge them due to the number of parts available. Your little girl or boy’s motor skills and hand-eye coordination will be able to develop well with this set. Their problem-solving abilities may also be improved if they ever get a little stuck on parts. The finished set includes a train with tracks that has a spinning tree to add a fun visual aspect. There are also 5 mini figures included which kids love using in their pretend play games to be highly creative. 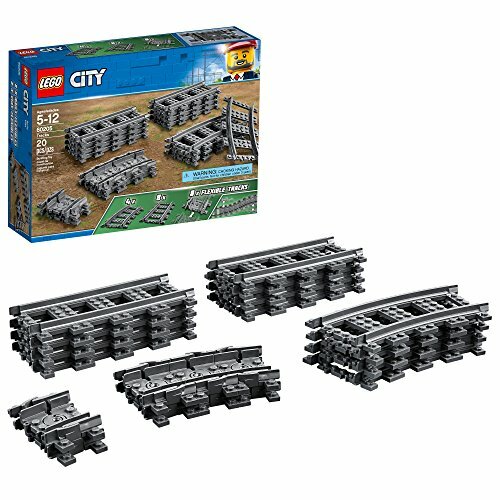 The set it also compatible with other Lego sets for even more imaginative building! Kids have been having a blast with the spinning tree feature and how there are so many min figures to play with. It helps children to use their creative thinking skills while playing. We were impressed with how there’s a Bluetooth remote available with this set that lets kids control their train toy. There is a range of pieces and instructions available for kids to build the set before they can play with it. This is a fun process that helps kids to develop their motor skills and hand-eye coordination. Once they’re done, they’re left to play with a RC train, as well as 2 cars, a platform, and a train track. In addition to this, there are mini figures available which allows kids to use them to play with a lot of imagination. 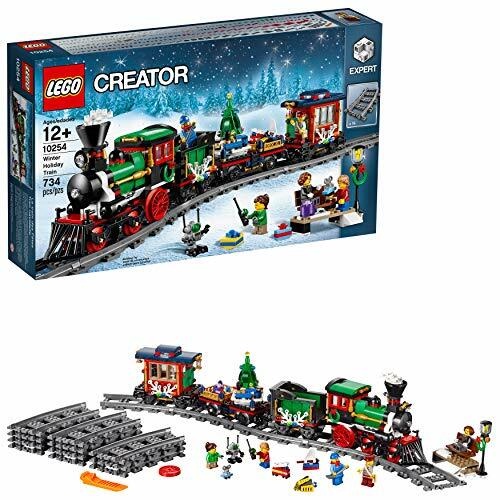 We also liked how this set is compatible with other Lego sets as it allows for super creative building and playing. Children have been loving how they can use the remote to control their train on the tracks while also using the mini figures to play creatively for hours. We liked how this set comes with an impressive total of 7 mini figures as well as a range of accessories. This provides your little one with plenty of toys to play with and use in their imaginative play games. This is a fantastic way to encourage your little one to develop their creative thinking skills. There is also a train and tracks available that allows kids to build their set before being able to play with it. The construction process is exciting and helps children to improve their motor skills and hand-eye coordination. Not to mention, if they get a little stuck, their problem-solving abilities will come in handy too. With so many accessories and mini figures available, your little one is able to have a blast being creative building and playing with this set for hours. This set comes with 20 pieces that kids can use to put together by following the easy-to-read instructions that are included. This construction process is great for your child’s motor skills and hand-eye coordination. Once they’ve finished building their set, your little one is able to play with a passenger train by using it on the tracks that are available. This allows your child to have a blast playing with the set in imaginative ways. In addition to this, we liked how the set can be used along with other Lego sets too. This provides kids with a great chance to build and play with more imagination to improve their creative thinking skills. This is an excellent train set that lets children build and develop their motor skills and coordination, while being able to be creative with it afterward. This Lego set comes with a range of 105 pieces which provides your little one with plenty of parts to assemble and keep themselves occupied for a while. Building this set is great for your child’s motor skills and hand-eye coordination. Once the set has been completed, kids are left to play with an electric train that moves along the 24 track pieces that have been included. You can control the train by connecting it to an app on your smartphone! There is also a harbor, cranes, cargo wagons, as well as a number of mini figures as well. So, you can be sure that your child is provided with plenty of parts to play with and be super creative for hours on end. Remote control available on an app! We liked how kids are able to control this train by using the app on a smartphone. Building the set is also a fun process that develops their coordination and motor skills. This is a fantastic set for younger children because it comes with 59 pieces and is a little more simple for kids to put together. While constructing this set, your little one’s motor skills and hand-eye coordination are able to develop incredibly well. Once all the pieces have been assembled, your child is able to have a ton of fun playing with the set for hours on end. We liked how it comes with a number of animal and human mini figures. These are a lot of fun to play with and help your child to be more imaginative with how they play. As a result, their creative thinking skills are able to improve. Furthermore, a remote is available that lets children control the train toy. With 59 pieces, younger children have a lot of fun being able to build this set independently and develop their motor skills and coordination during the process. 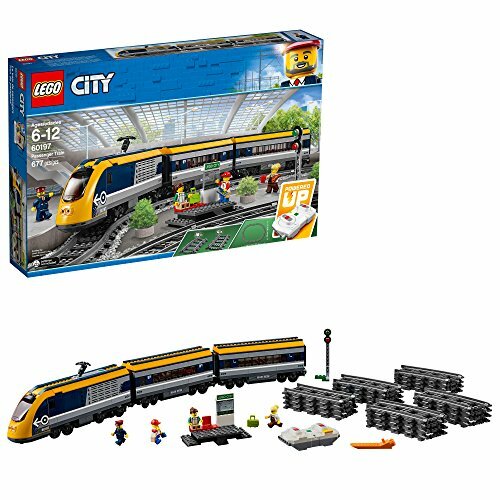 Kids are provided with a range of 677 pieces with this set which means that you can expect them to be busy for a while with building it. The construction process is great for your child’s motor skills and hand-eye coordination. With so many pieces, their problem-solving abilities may come into play as well. When the set is finished, kids are left to play with a RC train, cars, signals, a platform, and mini figures. Kids have a blast using the wireless remote to play with the set in a unique way. The mini figures and accessories are fantastic for encouraging your children to play with a lot of imagination as well. This is a great set that kids can spend a while constructing and improving their motor skills and coordination. They can then be imaginative while playing with the set after. We liked how the Heavy-Haul Train set comes with a total of 5 mini figure toys, as well as a range of accessories. These include a hopper wagon, helicopter, crane, and more to keep kids occupied for a long time. Children have a ton of fun implementing these mini figures and accessories into their pretend play scenarios. Therefore, you can expect your little one’s creative thinking skills to flourish. While children are building the train, they are provided with a fantastic opportunity to develop their motor skills and hand-eye coordination. If they ever get stuck, their problem-solving abilities will be tested and further developed. With so many mini figures and accessories available, your kids will be able to keep themselves entertained with this set for hours! Parents and children have been excited to discover that this set comes with a total of 610 pieces as it allows them to be engaged in building it for a long time. Their hand-eye coordination and motor skills are able to develop well. With so many pieces, their problem-solving abilities may also be used as well if they ever get stuck. When the set is finished, kids are able to play with a passenger train that can be controlled by a remote. In addition to this, there are a few mini figures included too. These are tons of fun for kids to implement into their pretend play scenarios. This provides your little one with a great chance to use their creative thinking skills. There are quite a few pieces available with this set which means kids are able to develop their motor skills and hand-eye coordination. 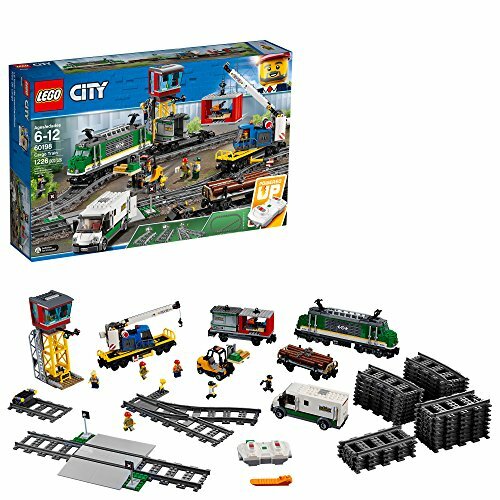 We liked how this set comes with a range of mini figure toys as well as a prison attached to the train that can be removed. There are also a number of carriages that can be detached, as well as awesome light up features. These light up feature make parts of the set glow in the dark which can be a ton of fun for kids to play with. They also love using the mini figures and incorporating them into their games to be highly creative. With 741 pieces available, you can be sure that your little one will be occupied with building this set for a while. It provides them with a great chance to develop their hand-eye coordination and motor skills. Kids have been loving the light up features as it makes the set more exciting to play with and encourages them to use their creative thinking skills. Children have a ton of fun building this Lego train set by following the instructions. It’s a super fun way for your little one to work on developing their motor skills and hand-eye coordination. When they’ve finished building the set, they’re able to play with the train on the tracks that are available. In addition to this there are 5 mini figures included, as well as a number of great accessory items. We also liked how there’s a coffee shop, platform, clock tower, and ticket counter available. This lets kids use the mini figures in their pretend play games to be more imaginative, which is excellent for their creative thinking skills. Due to how many different places, mini figures, and accessories come with this set, you can be sure that your little one is able to play with it creatively for hours. 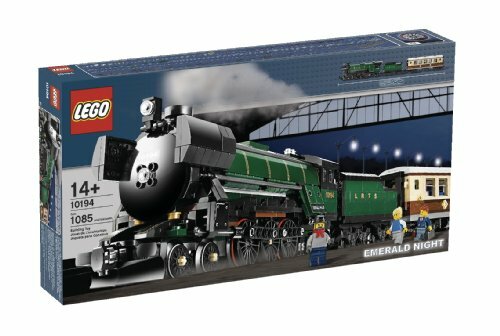 We were impressed with how the Emerald Night Train comes with a total of 1,085 pieces. This is a lot of parts that children can spend a lot of time with putting together by following the detailed instructions provided. You can feel confident in knowing that your little one’s motor skills and hand-eye coordination are able to develop well. Furthermore, their problem-solving abilities may come into play if they get stuck on some parts. Your child will also love how there are tenders and doors that can be opened and closed, as well as mini figures. It provides children with a great opportunity to let their creative thinking skills flourish. Kids are able to improve their problem-solving, motor skills, and coordination with this one since it comes with over 1,000 pieces! 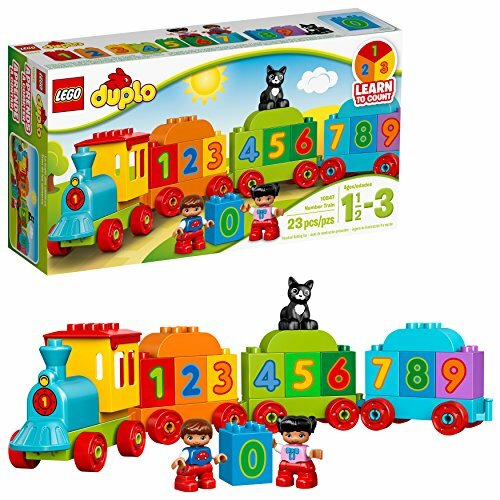 The Duplo My First Number Train is a fantastic choice for toddlers. This is because it involves larger pieces that are easier for young children to grip onto and put together without any hassle. As a result, your toddler’s motor skills and hand-eye coordination are able to develop well. Furthermore, the size of the pieces are great for helping your little one to improve their tactile ability. We liked how these pieces have also been designed with numbers on them. These are effective for helping your child to learn more about number 0-9 in a way that’s fun. There are also mini figures available that let kids play with tons of creativity. This is a fun set that allows toddlers to learn about numbers while developing their motor skills and hand-eye coordination. This is a 3-in-1 Lego train set which provides your kids plenty to play with and stay entertained for hours on end. There a tank engine train available with a light at the front and 6 wheels. This tank engine can then be rebuilt into a fast train or a carriage. While building these different models, your little one is able to develop their motor skills and hand-eye coordination. You can also be sure that they won’t be getting bored of this set any time soon. Furthermore, with 3 different train toys available to play with, kids are able to be highly creative and have a blast. The 3-in-1 design available with this one allow kids to build 3 different kinds of trains to play with for hours on end to be imaginative with. 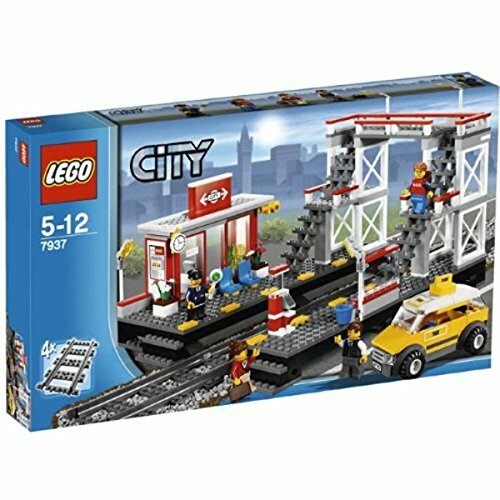 This City Train Station by Lego comes with 4 mini figure toys that include travelers, a taxi driver, and a train driver. There’s also a train station that features a kiosk, waiting area, and a couple of platforms. Kids love using the train toys to move along the tracks and through the station. It enables them to use their imagination when playing, especially due to the mini figures. Therefore, their creative thinking skills are able to improve. Moreover, while your little one is constructing this set, you can be sure that their motor skills and hand-eye coordination are provided with an excellent opportunity to develop well. Children can keep themselves entertained for hours with this set due to the 4 mini figures and how many different things there are for them to interact with. That brings our reviews of the best Lego train sets to an end. You can now consider the different options and start to narrow down your search to finding the one that you think your kids would enjoy playing with the most. However, if you’re still not feeling 100% confident, don’t worry. We’ve made this buyers guide section to provide you with some more information that can be useful in helping you feel awesome about making a final decision. 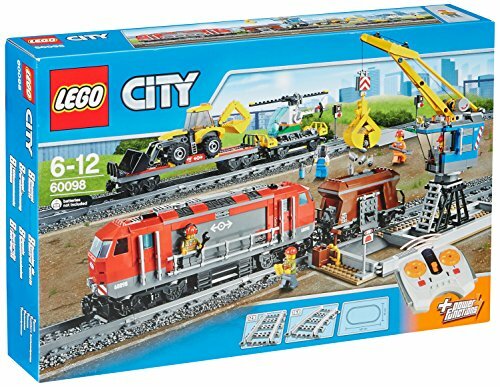 After reading through our review, you will have noticed that there are a range of different kinds of Lego train sets available. If you were interested to learn more about these sets and what makes them different from one another, take a quick look below. Cargo and freight trains are fun for kids to play with because they usually come with accessories that children can use to pretend to transport. This allows them to play with a lot of imagination as they can have a blast putting the loads in the trains and taking them out once they’ve reached the destination. We have included a number of awesome passenger and city trains in this review because kids have a ton of fun playing with them. This is because they often come with a lot of different parts to build and play with, such as platforms, kiosks, coffee shops, and more. In addition to this, since they’re passenger trains, you can expect them to come with a number of great mini figures. These allow children to implement them into their pretend play scenarios to play with tons of imagination and improve their creative thinking skills. The high speed trains that have been reviewed in this post are awesome for kids who want to watch their toy whiz around the track faster. Though it’s important to note that the ‘high speed’ is more of the design of the train in that it looks like a real high speed train and is not particularly fast considering that it can’t be when going around a small train track. Many of these options are powered by a battery and come with a remote. Children can use the remote to have control over the speed of the train, which provides them with a unique way of playing. Lego’s steam engine toys have a fun design that makes them look like the real thing. This allows kids to use them to play with a lot of imagination as the playing experience is more realistic. 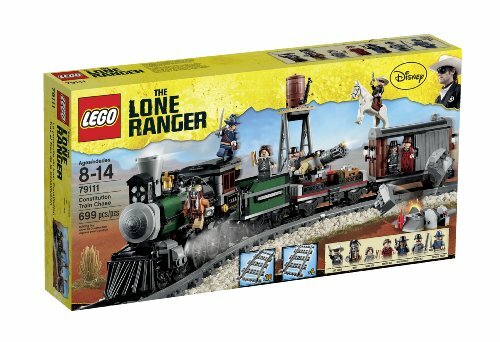 While doing some research of your own, and reading our review, you will have seen that Lego have a number of different train series available. It can be pretty confusing figuring out what makes them stand out from each other. If you wanted to gain some extra guidance on the different series that they offer, take a look at the section below. Children have a ton of fun playing with the City Cargo series because they come with a range of great accessory items that kids can use to pretend to carry cargo from one destination to another. Many of these City Cargo options are powered by a motor and come with a remote that allows kids to control the speed. 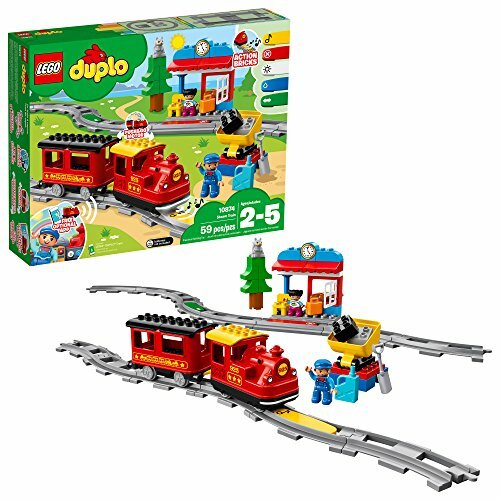 Lego’s Duplo train sets are awesome for toddler boys and younger children. This is because the pieces that come with it are larger which means that little kids can hold onto them and build their set without becoming frustrated. So, if you’re looking for your child’s first Lego set, a Duplo train one would be a fantastic choice. Kids who love the Harry Potter films have been having an absolute blast playing with the sets that Lego have to offer. They’ve designed the train to look just like the one from the films. They also include a range of mini figures that have been made to look like the characters from the movies. This enables kids to use them to recreate their favorite scenes and come up with their own pretend play games. As a result, their creative thinking skills are able to flourish. 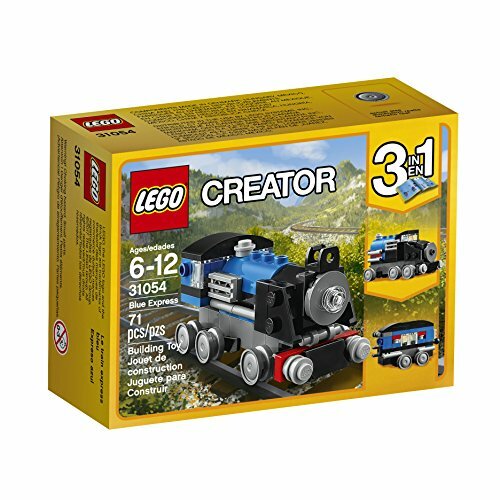 The Lego Creator sets are best for slightly older children or those with more experience with these sets because they come with a lot more pieces that are more complex to put together. They are more challenging and can improve your child’s problem-solving skills if they ever get stuck. Moreover, you can be sure that they will be engaged building and playing with the set for hours. These train sets that Lego manufacture allow kids to add to it over time to make it larger. This is because they have made a number of accessory items that you can purchase as extra parts and to expand the set over time. If you were interested to learn more about what accessories Lego have to offer with their train sets, this is the section for you. There are a number of train sets throughout our review that are powered by motors. It may be a good idea to purchase a spare motor in case the current one ever wears down and stops working over time. That way, you can be sure that your little one won’t be disappointed if their train motor ever dies as you can simply swap it out. 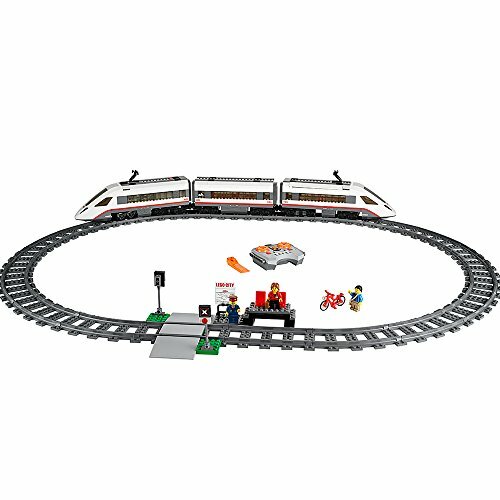 Lego offer wheel accessories for trains that let kids play around with the different options to see which ones they like best. These wheel accessories can also be great to keep handy in case the ones that are currently being used ever get damaged. Similarly to the motors, this means that you’re able to simply let your child swap out the wheels to continue to play with their set. Additional tracks are an incredibly fun way for your little one to be able to expand their train set. Adding more tracks allows their creative thinking skills to flourish as they can come up with all kinds of routes for the train to move across. This is also a fantastic way to make sure that your child won’t get bored of their set any time soon! If you’re looking to purchase a set that comes with just the train and tracks, a station accessory item could improve your child’s playing experience. This is because it enables them to interact with more parts and make it feel like a real train station. As a result, they are able to play with more imagination and develop their creative thinking processes. So, that wraps up our review on what the top Lego train sets for kids have to offer. Be sure to consider the main feature, pros, cons, age recommendations, and what makes each set stand out. Our buyers guide section also includes some great information that will have you feeling more confident about making a final choice.